If the Dawson-Joey-Pacey love triangle of Dawson’s Creek defined the early part of this century, the current decade is dominated by the on-off, will-they-or-won’t-they of Chris Brown, Rihanna, and Drake. Consider the fact that these are real people, throw in Chris Brown’s other sometimes-girlfriend Karrueche Tran, and we’re left with an epic love square. Will these kids ever settle down? Last week the gossipmongers of the Mirror threw out the idea that perhaps Chris Brown had reconciled or was attempting to reconcile with Rihanna by attending one of her shows in Pasadena, California. There was no proof that they spoke to each other, but Brown showing up at the Rose Bowl was enough to ignite the rumors. The tabloid says Chris had been “texting her loads since he got out of prison last month,” but apparently it was all for naught because Rihanna is back with Aubrey Drake Graham! The rumors begin anew at — where else? — a concert. She attended the Drake and Lil Wayne show in Queens, New York, on Tuesday alongside Wayne’s entourage. If this video is any indication, she had a spectacular time. She doesn’t merely sway along and groove with the music; her entire body appears to have been gripped with a force so strong that she can’t help but throw herself around along with the beat. It’s an impressive display. 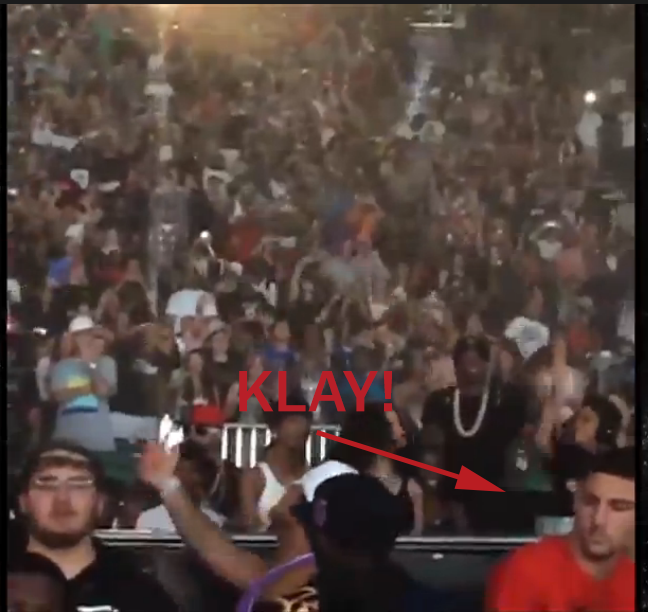 Perhaps her drastic motion is what has Klay Thompson (in the New York area for USA Basketball) looking so perturbed. The speculation about Rihanna and Drake rekindling has more supporting evidence than the bogus CB-RiRi claims of last week. Robyn and Aubrey partied together at 1Oak (the same club Jay Z allegedly wanted to go to the night of the Elevator Incident) and the Attic. One thing is clear about these two: They just love nightlife. They were out late the night before at the Griffin, though they left separately despite Drake’s (alleged) attempts otherwise. He sounds so tender. Don’t worry about Chris Brown, though. (Does anyone anywhere ever worry about Chris Brown anymore?) He seems to be back ON with Karrueche. The circle closes here with their date night to watch Team USA take on the Dominican Republic last night at Madison Square Garden. If this Instagram is any indication, he may be looking to consummate soon. I knew there was rupture in the Cannon-Carey universe back in the spring, when they did not celebrate their anniversary with inordinate fanfare. In years past, they have taken over Disneyland to commemorate the day. When the day came and passed without an Instagram of, at the very least, a formal dinner, Nick and Mariah tacitly admitted defeat. Now a divorce is imminent. “Page Six” reports that they’re living separately and that Mariah recently hired security to keep Nick away from other women. When the trust goes, so does the relationship. Nick is a self-professed lover of being in love, so I know he’s taking this hard. Plus, he may need to find some new special music. It’s been a fairly quiet summer for LiLo. She was with the rest of the celeb world in Ibiza. Then she moved on to Mykonos, Greece, where she borrowed a child for an afternoon. (Hopefully he won’t be traumatized forever.) Now she’s back Stateside, and, well, not much has changed. She was at the Hamptons outpost of the aforementioned 1Oak, where her credit card was denied. She attempted to pay a $2,500 tab. Luckily for her, she’s about to find gainful employment in a David Mamet play. Luckily for the bar owners of New York, the production is in England. I wonder if she knows about the very stiff exchange rate. Hopefully she took this into account when negotiating her fee. The power couple of the Riviera, Zac Efron and Michelle Rodriguez, have parted ways after just two months. Some couples just can’t make it in the real world. Now that this experiment is over, did either Rodriguez or Zef actually benefit from this fake relationship? It has less value than a reality TV showmance. They both have decent careers — Neighbors was a hit for him, and Fast and Furious keeps her afloat. They both have messy personal lives — he was in rehab and recently had a bizarre Skid Row run-in, she was rumored to be in a love triangle over Cara Delevingne. But in no way does their two-month dalliance make either seem more stable. Summer love is confusing. If I could invite one celebrity to my wedding, it would be Bruno Mars in the hopes that he’d jump onstage and perform some covers. He’s an incredible entertainer. But if he can’t make it for any reason, the obvious no. 2 is Reese Witherspoon. TMZ caught her dancing and singing along to “I Will Survive.” She looks appropriately disheveled, visual confirmation that she was probably raging on the dance floor. Her eye makeup is smudged just enough to indicate she was sweating. And she’s throwing her hands up like all women do when they dance in a pack. We should commend Reese on how she pivoted from her DUI. She has embraced the fun-mom-who-likes-to-have-a-drink persona, and what’s wrong with that? You do you, Reese!